Several months ago, I ran across an estate sale on the way to breakfast with friends. My hubby spotted it; however, we continued on as there were 3 cars following each other. On the way back my hubby suggested we stop and take a look, as he always admired that house from afar. I am glad he suggested we stop as I found some great things there. the booth and I was really good with that! I painted this maple drop leaf table with Annie Sloan Pure White. and managed to take a photo of one of the legs of the table. so I tried this space and I loved it, thus how to create a cozy writing corner. This room is about to get a bit of a makeover soon. I am wanting to add more black accents to coordinate with the bed frame and the chandy. in the first picture featured on this post. 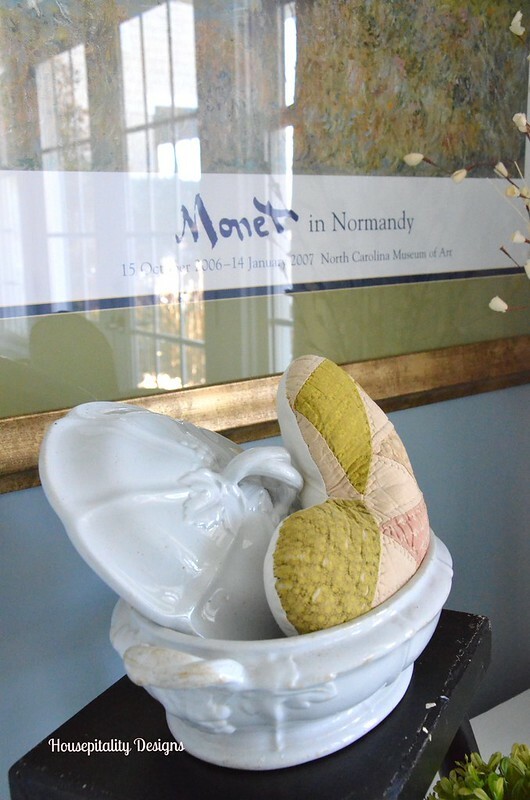 like this ironstone tureen with a vintage quilted heart that my granddaughter loves. I placed this French Enamelware Pitcher that I bought in France on the desk. This pitcher was originally in the guest bath. 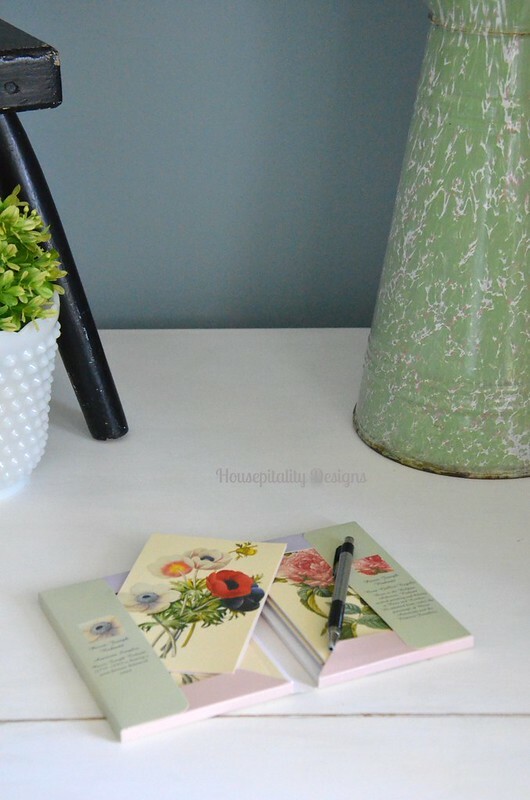 want to add a basket of postcards and stationery to offer guests if they shall need them. With the one of the leaves of the table up, it created a nice surface for writing or computer time. 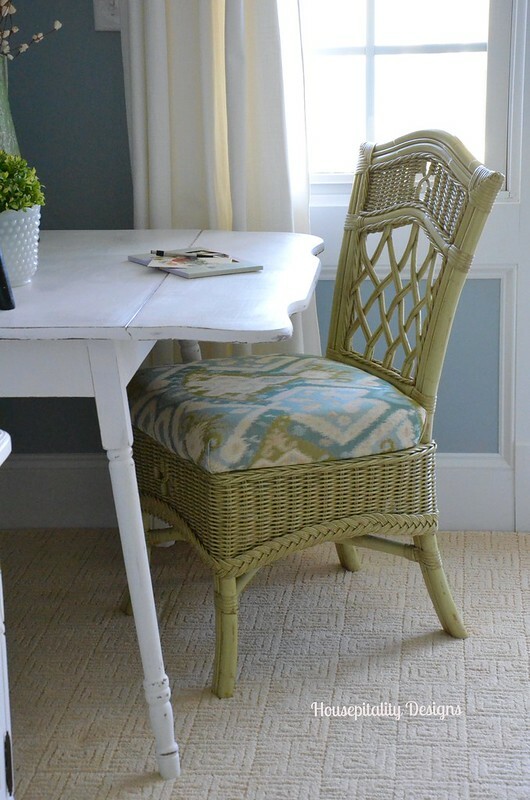 The wicker chair was previously on the other side of the room tucked under a table used as a night stand. the desk. If you were a guest, would there be something that you would like to have on a writing desk? I love drop leaf tables, and I also love them when they are used as desks. Yours looks great. Rita C. (Panoply)’s recent post…Goodbye January, Hello February! Maybe a lamp for some light in that corner. Love the cute shape of that table. Looks great but I agree with the previous posts…a small lamp. Then you will have the perfect spot for guests to write or use their computer or IPad. This is such a wonderful area, Shirley! I love the idea of having a writing desk in a bedroom. Your accessories make your table/desk so welcoming. Drop leaf tables are a favorite of mine because they are so versatile. You found a jewel in this piece! Betsy@coastal-colors’s recent post…The “A” Side Is Complete! The table is so cute! That could work is so many places in a home but I love how guest can write postcards. Hi Shirley, You created a lovely little writing corner that just draws you in. 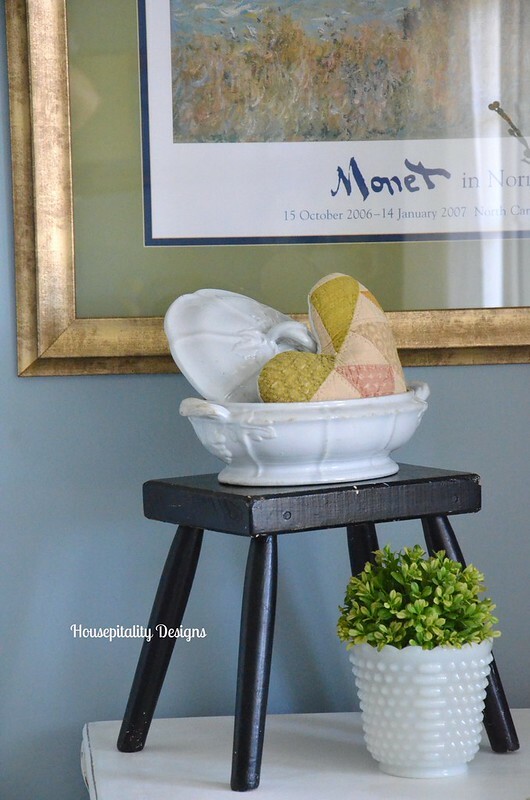 I love styling little corners like this in our guest rooms. You added the perfect accents. Love your pitcher from France. 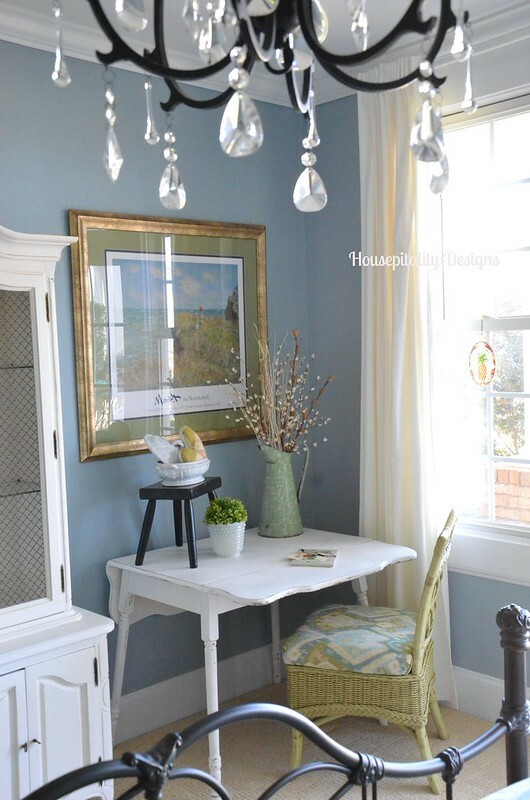 The drop leaf table is a treasure and I love the chalk paint color. I love your writing corner. I’m looking forward to seeing the black and white changes too. What a wonderful desk for the guest room. 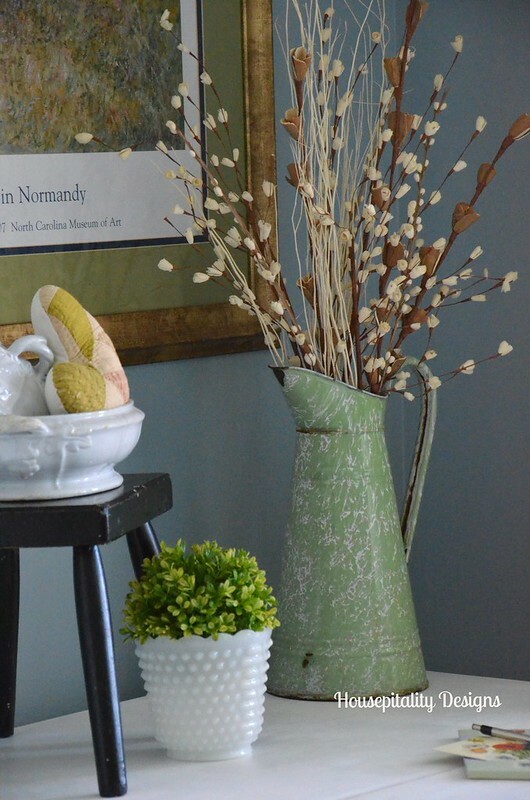 penny @ the comforts of home’s recent post…Welcome February! Lovely! I would love to see how you fashion a charging station. I have family coming next week and want to do one for my guest room too and need some inspiration. that and perhaps a nice glass of wine! :) I have always wanted to find a drop leaf table for our guest house. If you spot another let me know and we will be twinzy’s. Is that a word? Hope you have a marvelous day. cleaning kids bedrooms….ugh. see why i need the wine! 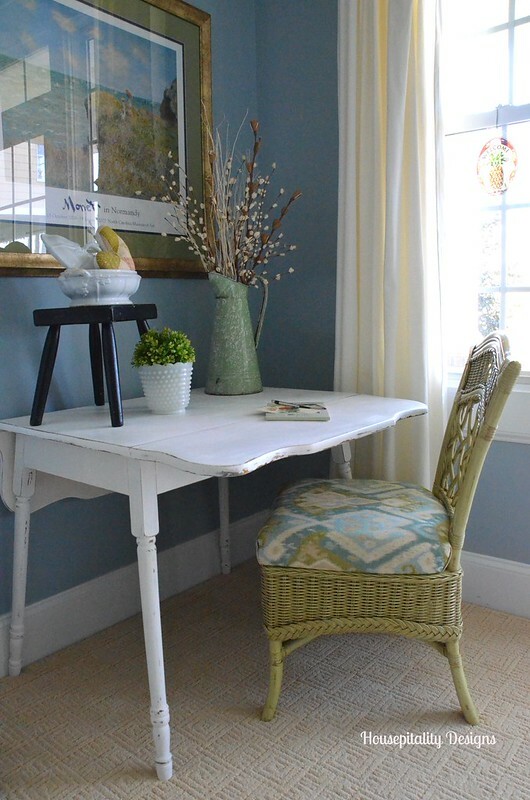 Love the little table….what a great idea to use it as a desk. The little black stool is just too cute and looks great with the white ironstone tureen with heart on top!!!!! 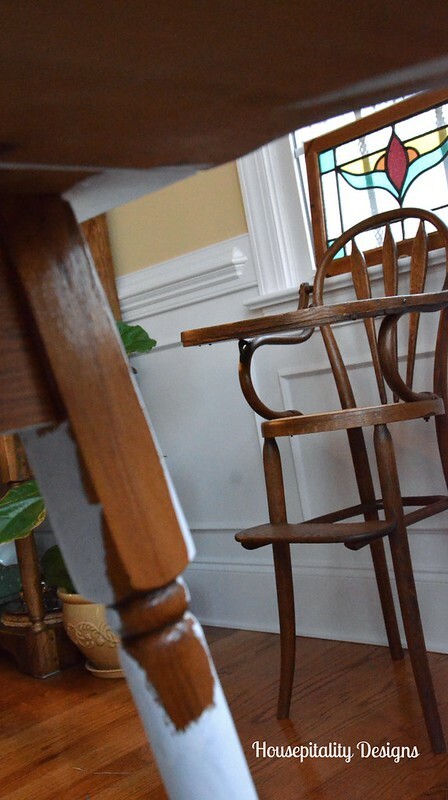 Des’s recent post…A little chair makeover……. Whenever I am a guest I LOVE to have a place to put my make up on! Most homes don’t have that. I have a vanity table, with a lamp and magnifying mirror in our room so am used to sitting down to do it. So, a lamp and magnifying mirror, available but maybe hidden somewhere would be great!?? I love that table and great idea to use it as a desk! 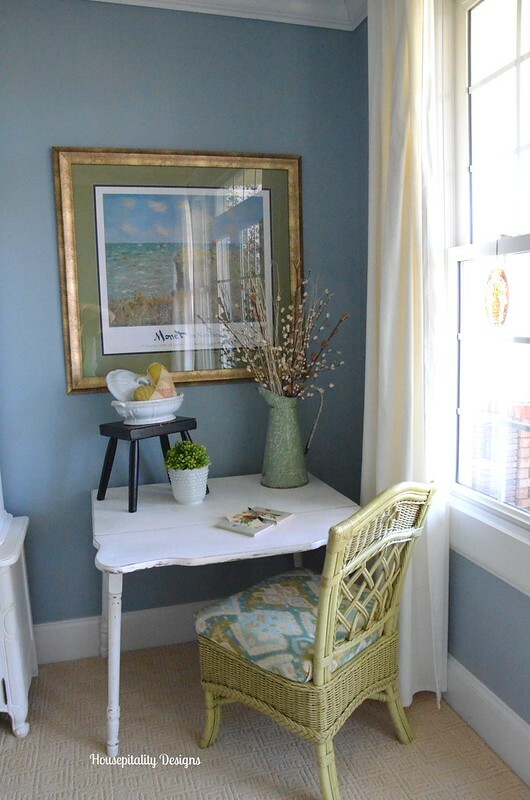 I love your cozy writing corner Shirley…the only thing I would add is a small lamp…and I love the peek we got of the hutch…can’t wait to see more! Great job, oh, and I LOVE the little black stool, the black is a perfect choice and that little stool looks as if it could tell stories. Great job! How lovely Shirley and you have the best husband in the world to want to go back and stop to see the house!! You always give me such inspiration. Until I saw your quilted heart in the Ironstone bowl, I had forgotten that I one similar so I am digging it out today! I saw a small vintage desk light recently that would look so great on your writing table. What a great table and you have it styled so beautifully too. At my desk for guests I have a old ink pen holder with a marble base(because it is pretty, not to use) and a postage stamp holder with a marble base as well, with stamps in it. You could also add a lovely coaster for their coffee and a lovely mug with some ink pens in it. I would for sure add a light. Oh my…I always seem to put too much on tables and desks! :)It certainly looks lovely! Love this and love your little writing corner. The drop leaf table is really cute. Love the way you styled your little corner too. Have a great rest of the week Shirley. I love drop leaf tables, Shirley, and this one is so pretty. It looks like it fits that corner perfectly, too. I love that little table. It looks entirely different once you painted it and looks very nice in that cozy little corner. I love that room. I love the inspiration that you give. I think the room is very comfortable and anyone would love to sleep in that beautiful room. I agree that you need a charging station. I have seen ones that you can put several different types of charging cords in. Also may be a nice little bedside pitcher of water with glass. Other than that you are good to go. Shirley, you have to know I ADORE this writing nook!!!! 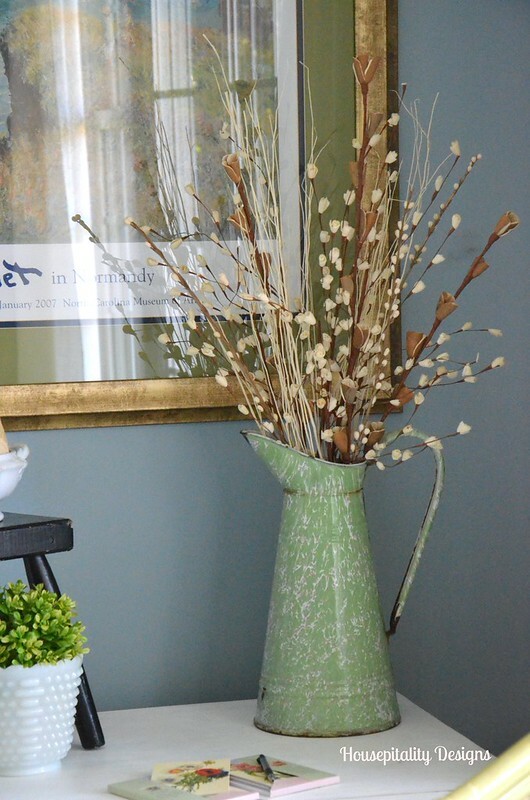 Everything works so well together…love the shades of greens mixed together with the darling white table. I’m drooling over the French pitcher! So pretty, Shirley! When we get a new phone/tablet/etc in our house, we throw the old charger into a covered basket in the guest room. That way, guests can usually find one that works if they realize that they left theirs at home. Mary’s recent post…Weighing in on Ball Jar Love: Purple Heritage Jar Giveaway! I really love the writing desk in a bedroom… Reminds me of the old movies writing in the evenings. I also agree a lamp would be a nice touch especially if the guest doesn’t want to disrupt the pther half while they sleep. Love this space Shirley! It turned out great. Thank you for partying at my place. Such a sweet spot Shirley! I love the ironstone tureen and quilted heart too!